Intramembrane proteolysis of APP by the γ-secretase complex. Accumulation of the amyloid-β peptide (Aβ) in senile plaques is an invariable pathological hallmark of Alzheimer´s disease (AD). Aβ is derived by proteolytic processing of the β-amyloid precursor protein (APP) through the combined action of the membrane bound aspartyl proteases β-secretase and γ-secretase. 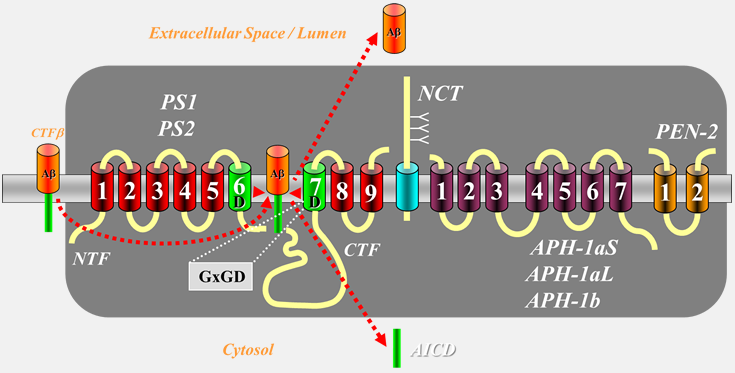 γ-Secretase is a large protein complex composed of the AD-associated presenilin (PS) proteins as catalytic subunit, nicastrin (NCT), APH-1 and PEN-2 and cleaves APP within its transmembrane domain.